Published: Jan. 3, 2014 at 10:40 a.m. 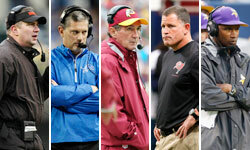 Updated: Jan. 3, 2014 at 11:56 a.m.
Tennessee Titans coach Mike Munchak admitted earlier this week that it was "hard" to deal with the uncertainty surrounding his job status. That uncertainty could end Friday. NFL Media Insider Ian Rapoport reported that Titans CEO and president Tommy Smith is meeting with Mike Munchak on Friday in Houston. Smith met with general manager Ruston Webster on Tuesday and Thursday, and Munchak's job status remains very much up in the air. Jim Wyatt of The Tennessean first reported the Friday meeting with Smith. One huge, pressing question left for Munchak: Will he listen to suggestions about staff changes? The status of Gregg Williams is one of the big issues. Internally, there is some belief that Williams, not Jerry Gray, should be defensive coordinator. Williams could earn a promotion. The staff has been kept in the dark about their status. Rapoport noted earlier this week that Tennessee's decision-makers weren't pleased with how the Titans veered away from their run-heavy offense to throw the ball more down the stretch. Rapoport previously said that he "would be shocked" if offensive coordinator Dowell Loggains remains with the team. Munchak might have to go along with proposed staff changes in order to keep his job.